Few have carved out the niche and reputation that Bushwick Bill has. The Jamaican came to the US and took the music industry by storm. As a relatively small man (in size), Bushwick Bill managed to horrify the world when in a drunken altercation with his girlfriend, managed to get his eye shot out. Since then, every word uttered within his verses has been taken literally. Though, even with his reputation preceeding him, Bushwick Bill turned out to be a very nice guy when I spoke with him at the end of December, 2004. MVRemix: How did the name Bushwick Bill originate? Bushwick Bill: It originated from Bushwick Brooklyn. That's where I got the name from, that's where I'm from. MVRemix: Which artists inspired you when you began, and why? Bushwick Bill: All the rappers. From Busy Bee on down to Melle Mel. T-La Rock, LL Cool J, KRS One, Just-Ice, Marley Marl and the Juice crew. I grew up in New York when rap started with the Sugarhill gang. I wasn't raised in the south. Bushwick Bill: That's the title of the album because the foundation is where everything is built from, where everything originates from and is established from. Geto Boys established rap in the south. We proved that we can go gold or platinum without livin' in New York or L.A.
MVRemix: Why did you change the name though from "War & Peace" to "The Foundation"? Bushwick Bill: Because the world's at war, no-one is searching for peace - so we might as well establish a foundation that disputes war and hope for peace. Because the streets is a warzone, love is a battlefield. To strive for a better life and success, there's obstacles in front of opportunities. "The Foundation" shows you that we don't only reflect street life. We reflect what politically affects us, whether it's schoolbooks, whether it's sad zoning laws... Whether it's police harassment... Whether it's a lack of help from our society. MVRemix: What inspired the group to re-unite now? Bushwick Bill: Well, no one is dealing with the issues at hand. Bushwick Bill: The Geto Boys are the forefathers whose crowns haven't been taken. MVRemix: Now, I know you're from Jamaica, but the Geto Boys' Houston sound is very different from the slower paced rappers that have become successful following yourselves. How do you feel about your contemporaries? Bushwick Bill: The Geto Boys sound has never been east coast or west coast; its always been gumbo. Its always been southern music, mixed with James Brown, mixed with Sly & The Family Stone... Pink Floyd. We listen to music and we emulate the music that we hear and put the southern feel to it. We never just locked ourselves into one genre. We did the music that felt good to the lyrics we were talking. Kind of like spoken word poetry... You might just want to hear finger snaps in the background when you're speaking a certain form of literature. There are some people who read books while listening to classical music. We just take the music that we like and put it into the southern feel. MVRemix: Are you still in contact with Jukebox, Johnny C, Ready Red or Big Mike (original Geto Boys members)? Bushwick Bill: Yeah, I heard from Big Mike the other day. Jukebox, I believe is still working at Rap-A-Lot. Johnny C, the last time I heard from him... He was working on writing Broadway musical scores. He's very musical. Bushwick Bill: If that's what the people want, that's what the people will get... Whatever comes with it. If there's something wrong with his election, then the people need to dispute that. Because the last time I checked, it was, "For the people, by the people" and "We the people." It's up to "We the people" to say something if we disagree. Bushwick Bill: I would let them listen to "Grip It On The Other Level," "We Can't Be Stopped," "Till Death Do Us Part" and "The Resurrection." I'd let them listen to all the albums because each album deals with a different subject matter. On the first album we had "City Under Seige" which dealt with a lady that was coming home from work tired and the police had the lights on her. She was so tired, she wasn't paying attention. So she stopped, got out the car and they asked for her license, then they shot her. They said it was an accident. We deal with issues that are really going on in our community. We don't dream them up. We deal with current affairs and current events. MVRemix: What happened around "Da Good, Da Bad, Da Ugly"? MVRemix: What have you been up to these past few years? Bushwick Bill: I've been building record labels, showing people how to get this book called "The Business of Music" and showing them how to build studios. Showing them how to fill out paperwork for publishing to make sure that no matter who they do a deal with, they're not screwed on the longevity part because publishing is what's gonna feed your children's children's children. You shouldn't be caught up in paperwork. 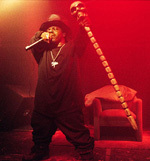 Bushwick Bill: I would fight Schwarzennaeger. Bushwick Bill: Did David beat Goliath? MVRemix: Aside from Hip Hop, what do you listen to? Bushwick Bill: I listen to classical music. Oriental opera. I listen to Jazz, Blues, R&B, Grunge. I like all music. There's no genre I don't like. I don't like any music that disrespects god. That claims that the devil is better than god. I would listen to it, but I wouldn't say that would be my favourite kind of thing 'cause I don't see what the devil has ever done right for us. When it's all said and done and you feel like you're dying, you don't scream out the devil's name. You scream out god's name. If a hammer splits the side of your head, are you gonna say "Oh god!" Or "Oh devil!" So I don't see why creatively people focus more on negativity than on positivity and keeping more true to life. MVRemix: Do you have any more solo endeavours planned? Bushwick Bill: Yeah, I got a new solo album... Well, it's a mixtape. It's past, present and future and it's called "Bushwick's Gutter Mix." It's coming out through A-Deck Records/Light-year through a joined venture with my label called Dollars & Cents Entertainment. MVRemix: What was your favourite album of 2004? MVRemix: Do you have any last words for your fans? Bushwick Bill: Yeah, I like that song by T.I. "Motivation." That's what we all need to make it in life. Whether you're gonna be a school teacher, a doctor, a lawyer or a big brother or big sister for kids who don't have big brother's or big sisters. If you can't motivate each other into positivity for longevity, then we're really not doing anything with our time on this planet at all. I'd rather be hated for who I am, than loved for what I'm not and this Geto Boy album is everything you ever expected from a Geto Boy album.